This year's rally was like a family reunion - you got reacquainted with old friends, made new friends, and shared meals together while you enjoyed the company of wives, girlfriends, and children. Rally host John Altom, with assistance from organizer Ron Bussey and route master Jim MacLean, held an event that put grins on everyone's faces despite passing Saturday thunderstorms. Friday found early arrivals Colin and Peter Goodall (Ontario, Canada) cooling off. 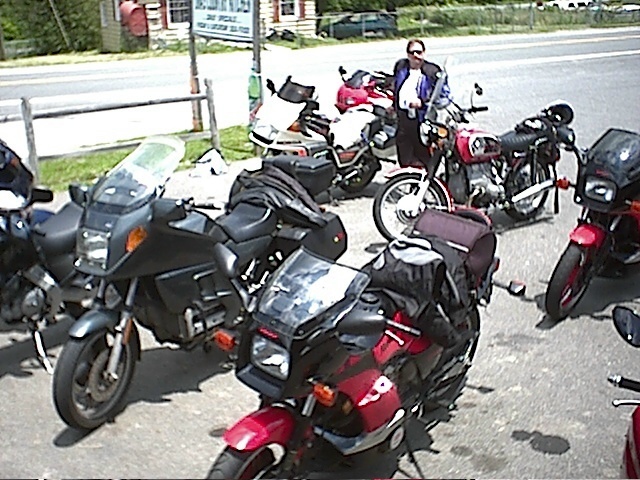 themselves and their bikes (CX500T & PC800) after a hot ride from north of the border. 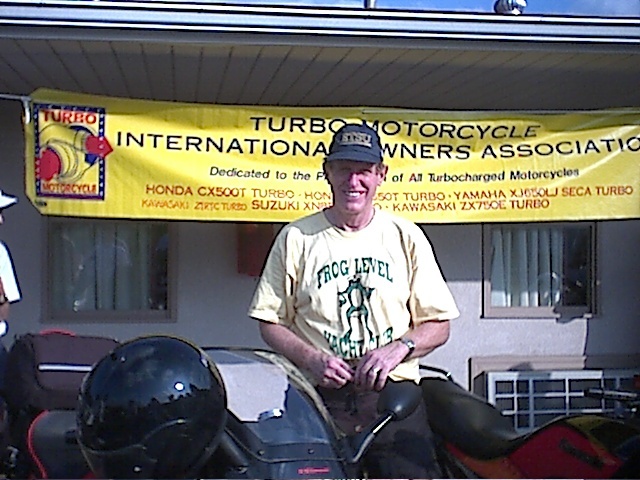 They were joined by Roger Twito (TN) and his turbos (ZX750E & ZX810E), Roger's sister (TX), and her ever-present poodle (TX). 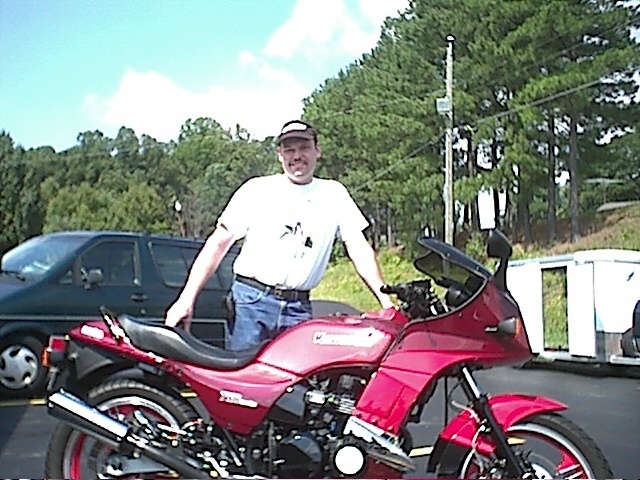 Brett Black (TN) was also there and eager to ride his new toy (ZX12R). At 12:30 p.m. yours truly rolled in on his trusty XJ650LJ after two days of riding from PA. By 5 o'clock Ron appeared with an ambitious rally guide including a Saturday 8 am breakfast gathering with the local BMW club followed by 240 twisty miles of road, a shorter and a more sedate Sunday ride concluding with a visit to his house for a look at his motorcycle/scooter collection. At 5 o'clock Ron led a small turbo assemblage to a local country kitchen where the entrees were $2.99 and all you could eat cost you $6.99. By 7 o'clock everyone was full of southern style fixins' and southern hospitality and the first of many thankful proprietors glad to have your business. At 9 o'clock riders lined up to purchase event tee shirts and five minutes later they were gone. 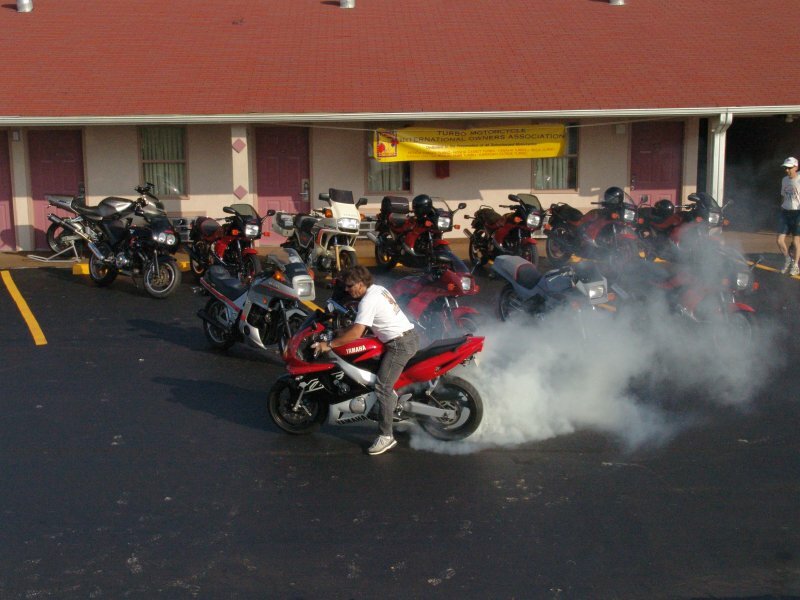 By late Friday evening 15 turbo riders, an English Gpz drag racer (Lorcan Parnell), and two ZX12R riders (Brett and Bob) had gathered in the Red Carpet Inn parking lot to bench race and kick tires. By midnight, most riders had retired, but a few riders chose additional local entertainment that lasted until sunrise. 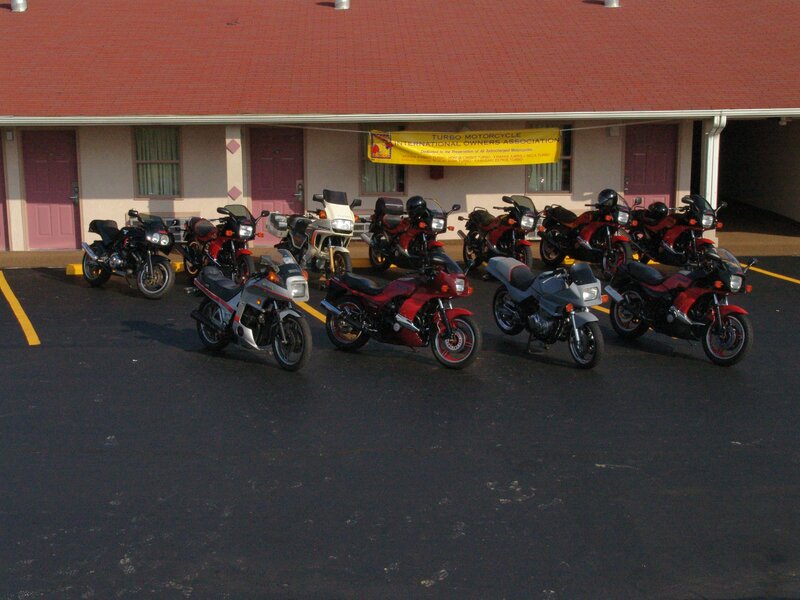 Not surprisingly, those same riders were absent when Ron arrived to gather a half-dozen riders for the BMW club breakfast meet. 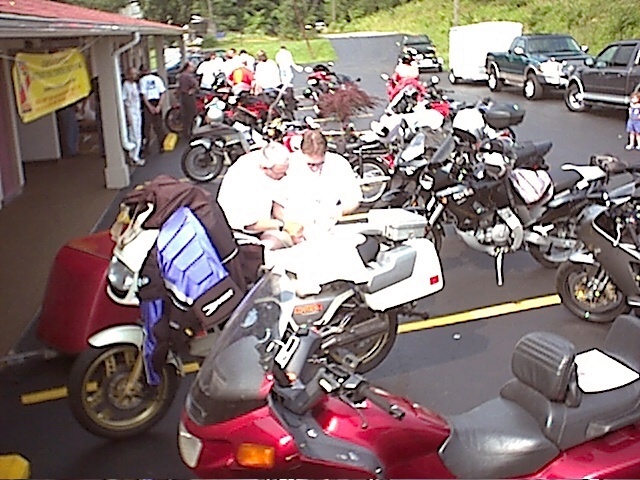 At 10:00 a.m. Ron held a riders meeting that included a few BMW club members then the riders went to the nearest gas station where Lorcan had trouble with his borrowed Moto Martin KZ900 Turbo and Robert Mitchell with his still in progress 836cc XN85. 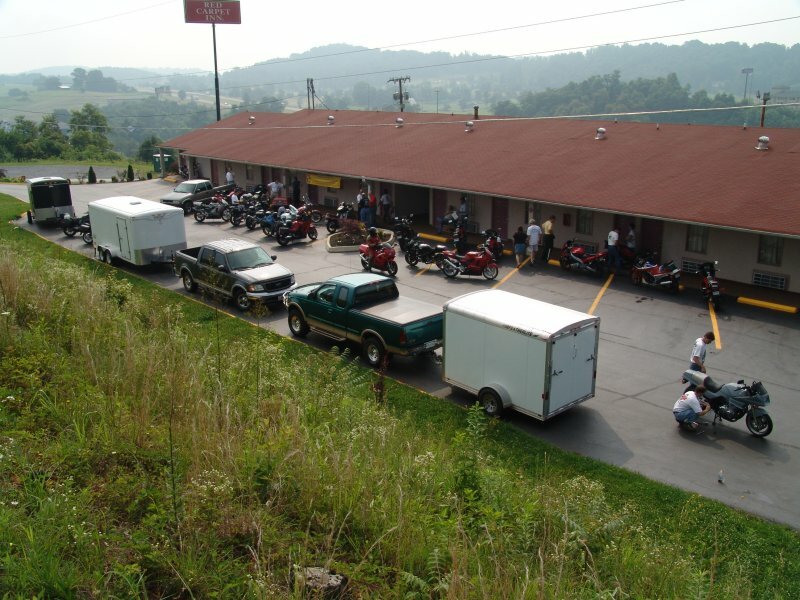 While back up bikes were obtained, most riders chose to motor onward to TN 394 past the Bristol Motor Speedway and US 421 - a road rumored to have 489 curves on the 15-mile stretch between Bristol and Shady Valley. 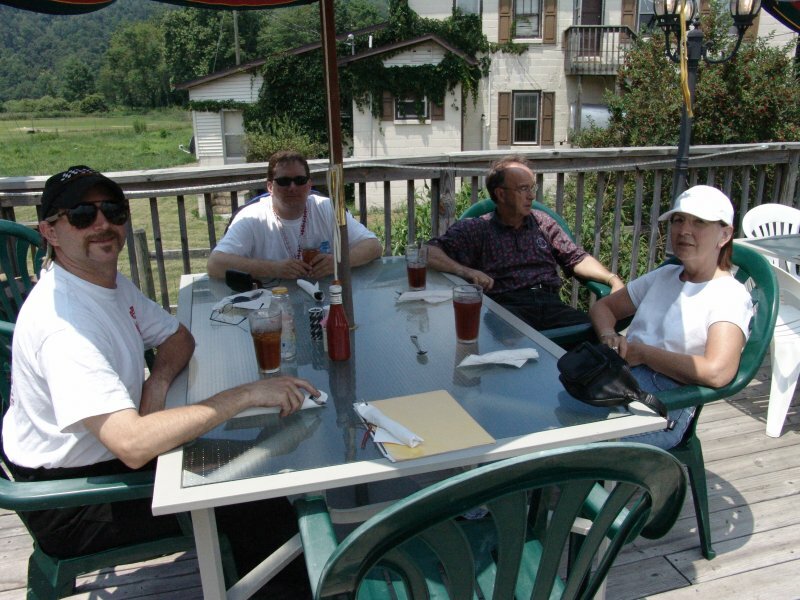 At the biker-friendly Shady Valley Country Store, the last group of riders encountered severe thunderstorms, but the first two groups motored eastward on US 58 to the Volney, VA lunch stop at Ona's Cafe. After regrouping, most riders left Ona's and encountered more thunderstorms causing many riders to beeline back to Kingsport on I-81. 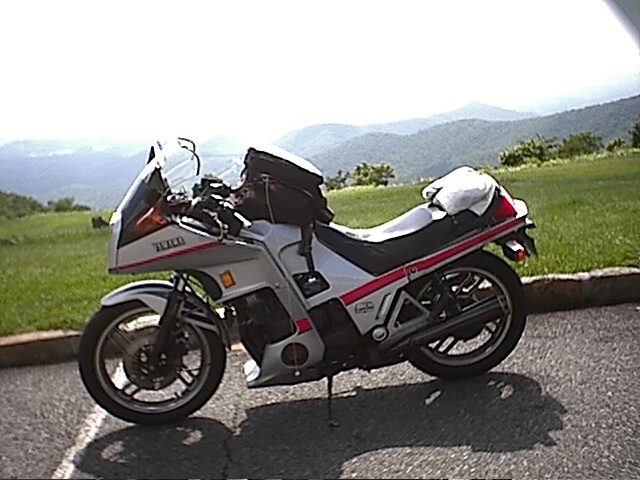 Only a few riders completed the rain soaked and dampened route that included three mountain passes on VA 16 between Marion and Tazewell, a blast down the dual-divided US 19, and a crawl on a goat trail know as VA 80. 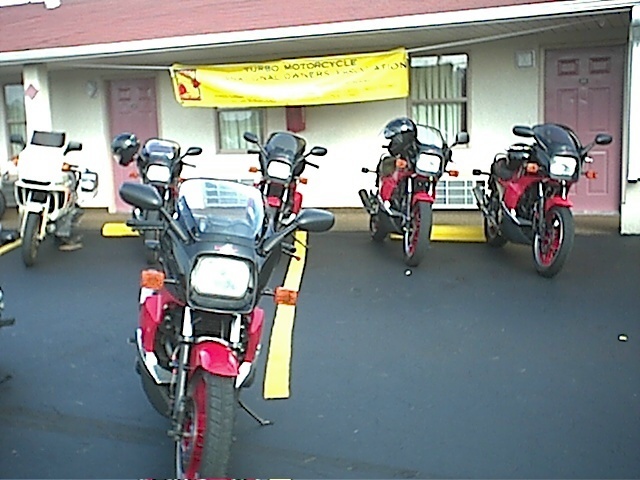 Saturday evening had some riders at the Cracker Barrel and some at Damon's Steakhouse, but all returned to the Red Carpet Inn parking lot for the day's recap and excessive bike polishing. Trophies and certificates were awarded and it was 1:30 a.m. before all the lights went out and cleaning rags were retired. Sunday morning most rally attendees bid adieu and hit the road for home. John Ey (Gpz Turbo), Mike Chestnut (Gpz Turbo), and Mike's friend Bob (ZX12R), Brett Black, and Colin and Peter Goodall were the only riders riding home when Ron arrived to lead six riders on the best riding day of the rally. 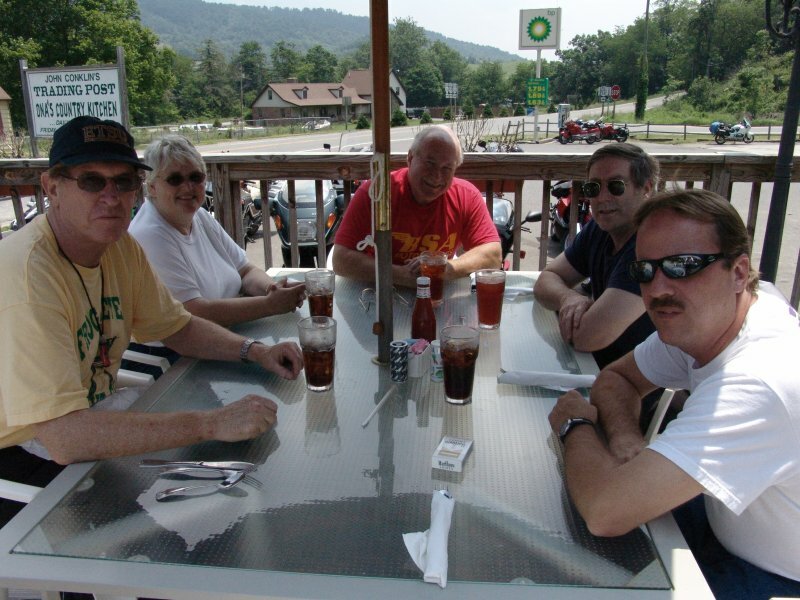 Glenn & Kathy Edwards (Concours), Ron & Laura Bussey (R1100RT), Paul Brown (VFR500), John Altom (SV650), Roger Twito (ZX750E), and Bob Miller (Yamaha Turbo) were treated to a westward looping 140-mile ride over seamless, deserted, sweeping two-lane roads that returned to Ron's house. 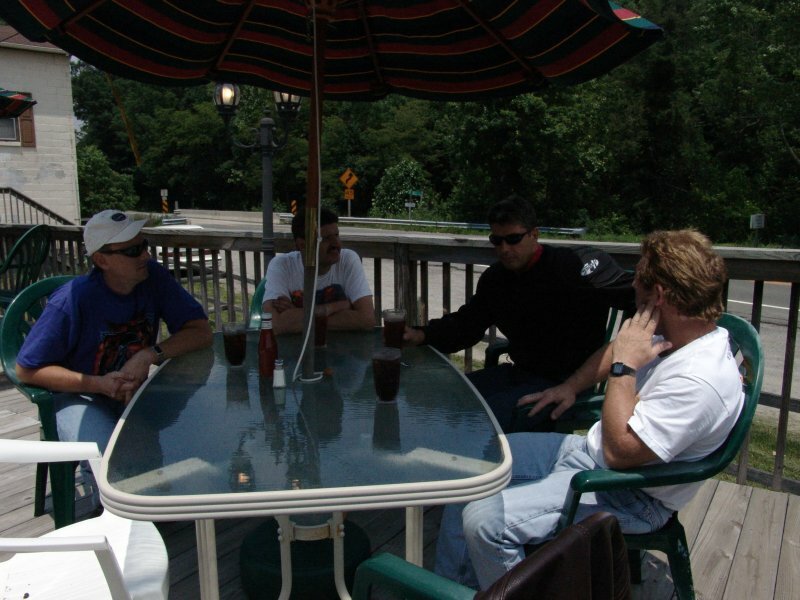 Roger and John split early for their respective two-wheeled rides home, but the rest of us put Ron's lakeside porch to good use for more than a few hours. Thanks to Steve Klose for the certificates, John Altom for the trophies and for hosting, Ron Bussey for organizing the event and creating the rally guide, Jim McLean (Gpz Turbo) for laying out the route, and all the diverse participants that keep the rallies interesting and keep us all coming back for more year after year. First time rally attendee Scott Schmidt (Gpz Turbo) volunteered to host next year's rally in West Virginia so look for updates soon. Trophy Winners: Best Honda Turbo - Colin Goodall, Best Kawasaki Turbo - Roger Twito, Best Suzuki - Robert Mitchell, Best Yamaha Turbo - Robert Miller, Best KZ/Z1R Turbo - Bill Brint's Moto Martin, and Best of Show - Bob's ZX12R. 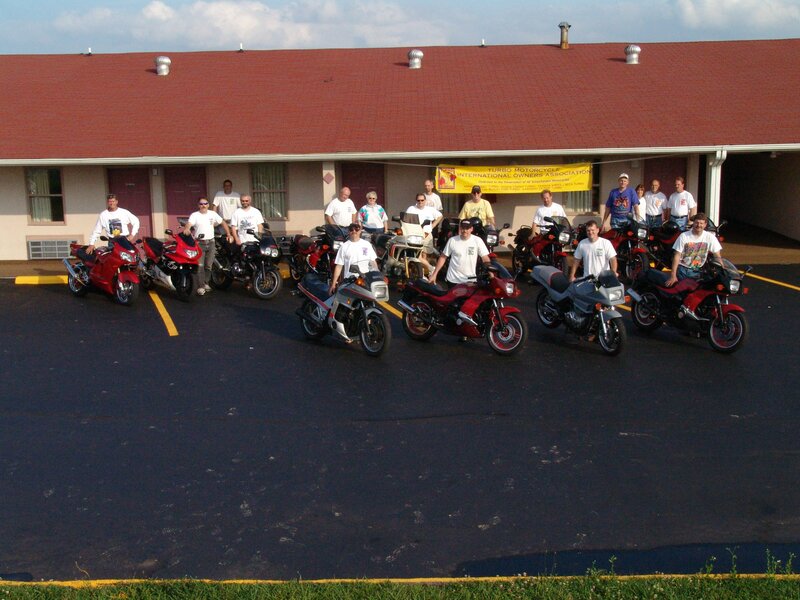 Certificate Winners: Longest Two Up Riders - Glenn & Kathy Edwards, Longest Trailered - Steve Smith (FZR600), Shortest Trailered - Scott Schmidt, Eldest Turbo Rider - Glenn Edwards, and Longest Distance Traveled - Lorcan Parnell (England). The first of two clips taken as the bikes leave the lunch break on Saturdays ride. The second of two clips taken as the bikes leave the lunch break on Saturdays ride. The first of two clips taken during the ride. 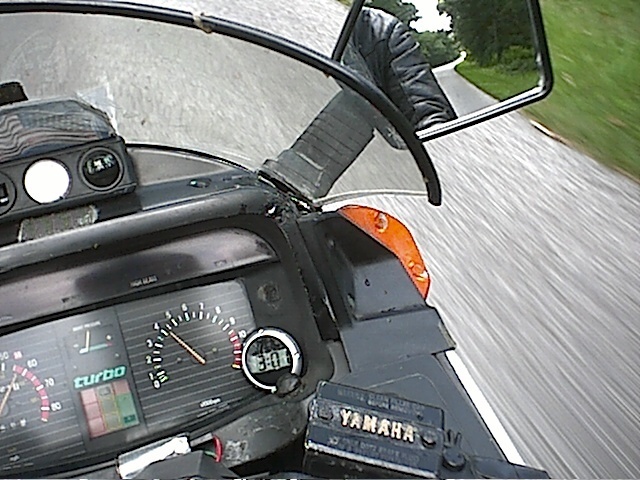 The second of two clips taken during the ride.